* The Thrill of It All was the 16th biggest hit of the year. Co-Starring James Garner, this flick was a great parody of the world of TV advertising. 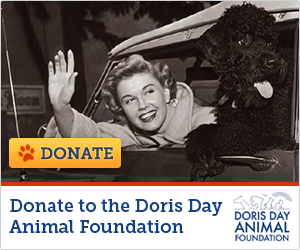 No music; by now, Hollywood producers have forgotten that Doris was first a singer and then an actress. The romantic comedy centers around Dr. Gerald Boyer, obstetrician (James Garner), his stay at home wife Beverly (Doris) and their two kids Andy (Brian Nash) and Maggie (Kym Karath). At a dinner party given by one of Gerry's patients the Fraleighs Beverly raves about how her kids love a new product called Happy Soap which the Fraleigh's just happen to manufacture. They offer Beverly an opportunity to pitch the product for $80,000 per year. However, this new career takes Beverly away for long hours from husband and family causing lots of comedic commotions for the family. Gerry comes home one night and promptly drives into his new swimming pool installed that day without his knowledge courtesy of the advertising folks. Furious he dumps on the Happy Soap into the pool causing mountains of suds to emerge by morning (tremendous fun for the kids). This movie was directed by Norman Jewison and written by Larry Gelbart and Carl Reiner. Reiner appears in some great parody of live TV theater. This was the last film appearance of Zasu Pitts. Her passing marked the end of a long and successful career as a comedic and well respected actress that began in 1917. Beverly Boyer: [On live camera and nervous] Hello. I'm... I'm Beverly Boyer and I'm a pig. Old Tom Fraleigh: A pig? Andy Boyer: What did mommy say? Olivia: She said she was a pig. Maggie: Why is daddy yelling at mommy? Andy: Because mommy wants to be a TV star and daddy won’t let her. Walter Matthau was offered the part of the middle aged expectant father. Matthau demanded $100,00 but producer Ross Hunter said no. "Carl Reiner had intended the role of Beverly Boyer for Judy Holliday, whose ill health prevented her from making the film." "Producer Ross Hunter unsuccessfully tried to reunite Jeanette MacDonald and Nelson Eddy to play the roles eventually played by Arlene Francis and Edward Andrews. Before Francis was cast, Kitty Carlisle was also mentioned for the part." "The music used during the scene that Mrs. Fraleigh is having her baby in the limousine is the same music used in the pilot for 'The Munsters'. The pilot made in 1963 did not air for the public until 2007." When introducing guest panelist Ross Hunter, Arlene Francis mentions this film they did together. The ad agency's viewing room has both color and black-and-white TVs side by side. This was common at ad agencies in the 1960s to confirm that color commercials would also be acceptable on black-and-white sets.